Chunkers like the feeling of accomplishment that comes with getting a big swath of practicing done. They would feel uneasy having practice time “hanging over their heads” the rest of the day—better to just do it. They may also “chunk” because of their particular life situation—perhaps their class or work schedule does not allow for “nibbling.” The primary issue that chunkers face is “vocal load”—in order to stay vocally healthy, they must insure that some non-vocal practice modalities are interspersed within their practice time (e.g. writing in translations, writing out lyrics for memorization purposes, playing melodies on the piano to solidify pitches, etc). Nibblers feel overwhelmed / bored / less productive when “chunking.” They would much rather do four 20-minute practice sessions than one 80-minute session, for instance. They feel more alert, more productive, and more vocally fresh when they split up their practice. Their schedules have small gaps between classes or between lessons that they teach, but finding an 80-minute block of continuous time—are you kidding me? The pitfall for nibblers is that they must insure they get all of their practice time in. It’s not so hard to get that first 20-minute session in, but they must insure that they’ve planned the other sessions into their calendar, or else they will come up short from a quantity perspective. Also: when it comes to practicing, both quantity and quality matter. So whichever practice personality you are, make sure that you’re getting quality practice, but enough of it! Students, talk to your teacher if you’re unsure what your quantity goal should be. Alright, gotta sign off—time to practice! To quote Mikado, “I’ve got a little list…” In advising my students about YAPs, I noticed that most listings of the programs are all mushed together—opera-heavy programs next to song-heavy programs, etc. How is one to tell these apart? It got me thinking: as I see it, there are 8 primary avenues that classical singers can pursue. Here’s the kicker: Most classical singers I know pursue 3-4 of these, and almost none of them pursue all of them. Early on in your training, it’s wise to not “pigeon-hole” yourself. Your voice, your taste, your exposure to styles/periods/languages… it all needs to develop. BUT, the world is big, and time/finances are finite. At some point, it can save a LOT of heartache for a singer to decide where the intersection of their talent, skill, and taste lies. For me, I figured out [through the help of my first great vocal mentor, the terrific Steven Stolen], that mine would be a career of art song + oratorio/concert work + early music. My background as a trumpet player and my early exposure through a top-flight children’s choir bolstered my musicianship chops, and thus new music was added to the mix for me. And rather by accident, I landed my first gig [and then another, and another, etc] in the pro choral singing world. That ecosystem didn’t even exist when I graduated from college, and so it was not on anyone’s radar screen as a legitimate avenue for professional singers. Fortunately, that has changed drastically! Note: I am not at all suggesting that I wholesale exclude other genres—I love to sing opera when it’s right for my voice and the timing works with the rest of my life. I love singing jazz standards, but not as a main line of my career, etc. I now use the above list, and when the time is right with each student, we discuss which of these will be the primary avenues they pursue. Seeing 3 or 4 checkmarks on this list then empowers them—spend your time and money on YAPs, competitions, etc. that play to your strengths. If you have no interest or aptitude for new music, then for goodness’ sake don’t pursue it. If musical theater was your first love, then cross over, child! If musical theater makes you want to hurl, then take a hard pass and don’t apologize! Don’t feel bad for a second that your list is different than other singers. You do you. I hope the list above can help you (or your students) to thoughtfully forge their path in the classical singing world! Kyle Ferrill teaches voice and vocal pedagogy at the University of Memphis, SongFest, and the Interlochen Arts Camp and performs around the country, primarily in art song and oratorio. I was very fortunate to study under Dr. Clifford Madsen during my schooling at Florida State University. A legend in the field of music education research, he implored us to regularly observe our own teaching in order to truly see what we are actually doing with our instructional time. Observation periods need to be long enough (at least 10 minutes) to account for the flow of lessons / classes / rehearsals. Taking samples from various lessons taught over time will give even more valid results. I have found that tracking over time builds awareness while I’m teaching. I very regularly can hear the “tick” of a mental clock when I’m talking too long and we need to get back to singing. I’m convinced that this awareness has been built by observation. *Approval = saying something was right. Disapproval = saying something was wrong. Approval error = saying something was right when it was wrong. Disapproval error = saying something was wrong when it was right. **Complete cycles of instruction: Put briefly, a complete cycle of instruction is prompt—>attempt—>feedback. Too often, students make an attempt without getting clear feedback. Not knowing whether the attempt was “right” or not, the time spent making the attempt is less useful than had they received feedback. Suspension: The missing tool in many singer's toolbox! The act of singing happens, of course, as we exhale. But ask any singer, “how do you breathe for singing,” and they’ll 99% of the time talking about inhalation, and precious little on what the sensation should be during and just before the tone (exhalation) begins. Importantly: when in the suspension phase, the glottis stays open. If we were to close it, then there would be all sorts of pressure behind the onset. Yuck. So how do we set up this delightful feeling of expansion? It requires that we practice 4-part breathing. Most singers practice 3-part breathing: 1. Inhale 2. Exhale (sing) 3. Recover. But this plan leaves out what should be the 2nd step: suspension! Here’s a plan to sing it with suspension. If a singer habitually sings on their suspension, then the sensation is that one is singing off of the “interest” instead of singing off of the “principal.” In other words, singing off of the “principal” feels like the sound is originating from the vocal folds themselves (this is very tiring), while singing off of the “interest” feels as if the sound is originating from the appoggio muscles, the muscles of suspension. That is the proper way to sing, and will lead to much, much greater vocal stamina. Kyle Ferrill teaches voice and vocal pedagogy at the University of Memphis, SongFest, and the Interlochen Arts Camp, and performs around the country, primarily in art song and oratorio. Need balance? Turn on your tomato! I find myself tutoring my students on balance / efficiency / time management / practice strategies almost as much as I teach them concepts of singing. I quite enjoy this work—it has far-reaching ramifications way beyond music, and can help them learn to “adult” with some sense of ease and grace. My central tenet of time management is BALANCE. I wear many hats, and I simply can’t afford to focus all of my day on any single project. I have to divide and conquer, bit by bit, drop by drop, day by day. And that’s where our friendly tomato comes in… In the 1980s, the “Pomodoro Technique” become popularized by Francisco Cirillo. He was reportedly inspired by his kitchen timer, which bore the familiar shape seen above. (“Pomodoro” is the Italian word for “tomato.”) According to Cirillo, the shtick is that you set the timer for 25 minutes, and then work assiduously on Task A. You then take a 5 minute break, reset the timer for 25 minutes, and then work on Task B. Etc, etc. By doing this, you get a little bit done on multiple tasks, and don’t fall in the familiar trap of getting a lot done on Task A while totally neglecting Task B. Now, if Task A is truly pressing, you of course could do multiple “pomodoros” on it, but the above notion of balance and boundary holds. I use timers on an embarrassing array of daily tasks: how much I sing, how much time I spend recruiting, doing yoga, meditating, tidying up, etc. They help me immensely to shift from one task to another, so that I can creep closer to that illusory goal: balance. Now I’ve really moved the needle on four different items, and practiced very wisely. As mentioned earlier, I also avoided the “tunnel vision” trap—it would have been easy to keep going and going and going with the Bach, but instead I switched gears and made progress on multiple fronts. So, get those pomodoros / egg timers / iPhone timers humming, and up your productivity while balancing your life! In an “every-freshman-must-take-it” world cultures course, we read the Tao Te Ching. I was captivated, and some further research led me to Buddhism, which became the spiritual underpinning for my adult life. An honors course my freshman year was all about modernism. I have drawn on that knowledge of people / works of art / schools of thought involved in modernism an untold number of times, particularly considering that one of my specialties is new music. A sociology class which I was sure I’d hate was actually fascinating — I had never before thought about norms, social mores and folkways, group-think, etc. These issues are of course a part of everyday life, in and out of academia and the music business. And randomly, in a conversation about effective studying for an upcoming test, my math professor introduced the Pomodoro Technique. Anyone that knows me well will attest that I’m fascinated by productivity, efficiency, and simplicity, and this conversation was absolutely the seed of that lifelong interest. All of these things have direct influence on my daily life, and they all came from my studies in the core curriculum. So, I hereby vow to never again help my advisees “get the core curriculum out of the way.” Instead, I’ll do my very best to help them transfer knowledge and inspiration from those enriching activities to their work and life in their chosen field. When we're starting out as singers, we don't know what we don't know. We might be perfectly willing to practice, but what are the elements of practicing? The Checklist I share below is nothing revolutionary--I certainly didn't make up any of its elements--but, it contains all or most of the fundamental steps to learning vocal music. By the way, this Checklist seeks to not only help you learn THIS song, but to grow your musicianship skills in the bigger sense as well. Things like count-singing, playing piano, etc. are designed for this double purpose. #1: A few handy websites for side-by-side translations are www.lieder.net for art songs and www.aria-database.com for opera arias. The library also has many books that have translations. Be neat when writing in your translation—don’t make a mess of your score. #2: Write the context information for your piece on a piece of paper and put it in your notebook with your score. Know where the piece comes in the story of the opera/song cycle/oratorio/musical. Answer the following questions: composer name, composer nationality, composer dates, composer era, poet name, poet nationality, poet dates. #3: Make sure that you know what every word in your score means, including expressive markings, tempo markings, articulation markings, etc. This includes markings in the piano part. #4: Check-marks/commas are not specific enough. Decide on the rhythmic value of each breath, and alter your score to account for them. Also, drawing in phrase marks helps your eye to see phrases rather than individual notes. #5: Be sure to keep counting through rests—this is where most singers zone out and lose track of where they are. Sub-dividing needs to become second nature. #6: Play your melody in tempo: this won’t necessarily be up to speed, depending on your piano skills. If you’re a good pianist, play bass line as well. And play as musically as you can--this will build a tactile sense of what your melody "feels" like, and reinforce musicality and expressivity. #7: Work on your pitch memory by checking to make sure that you’re staying in tune while singing unaccompanied. #8: As your language skills increase, you may only need to write in a few reminders. Write in what you need, but have the IPA transcription handy. If you’re not yet able to make your own transcription, try www.ipasource.com or books of transcriptions. #9: If the song is in a foreign language, monologue the English translation first. Then, once you know the poem, monologue the language. Don’t just read the poem: monologue it convincingly: you’re a singing actor. #10: Speak-singing trains you to sing legato—it is a marvelous technique builder! It will also train you to budget breath. #11: Now it’s time to put it all together! #12: Memorize fully, long before you have to perform your piece under pressure. Practice performing the piece (not just singing through it) in front of a mirror or better yet a video camera. Fix whatever you see that is unclear, over-done, extraneous, or tension-filled. Be sure you’re independent enough to sing it with accompaniment—use recordings or tape a pianist playing your accompaniment to sing along. Don’t let a rehearsal, lesson, or performance be the first time you’ve ever heard or sung along with the accompaniment. P.S. A major hat tip to Pamela Bathurst at the University of Idaho, who created a list like this for Freshman Vocal Seminar, and whose list formed the basis for the above. I'm increasingly convinced that two of the most crucial factors for singing success are mastering appoggio and the passaggi. Today, I'd like to offer some tips for the latter. Our goal, of course, is to sing smoothly from the lowest note we can sing to the highest--for the register boundaries to be imperceptible. I tried, for quite some time, to wipe away these boundaries by simply ignoring them, and of course that didn't work. I finally reviewed my various texts on vocal technique, and realized that they all contained remarkably similar information about where a baritone's passaggi would lie: the consensus is that the average primo passaggio is around B3, and the average secondo passaggio is around E4. Once I started doing scale work with full knowledge of what pitches I was singing [I do not have perfect pitch], I realized that, lo and behold, I had passaggi at the predictable places! Once I started recognizing the passaggi rather than ignoring them, my voice began to smooth out and my range expanded. And indeed, my goal of smooth transitions was realized. This is crucial: smoothing out my register transitions was only accomplished when I paid MORE attention to the passaggi, not LESS. 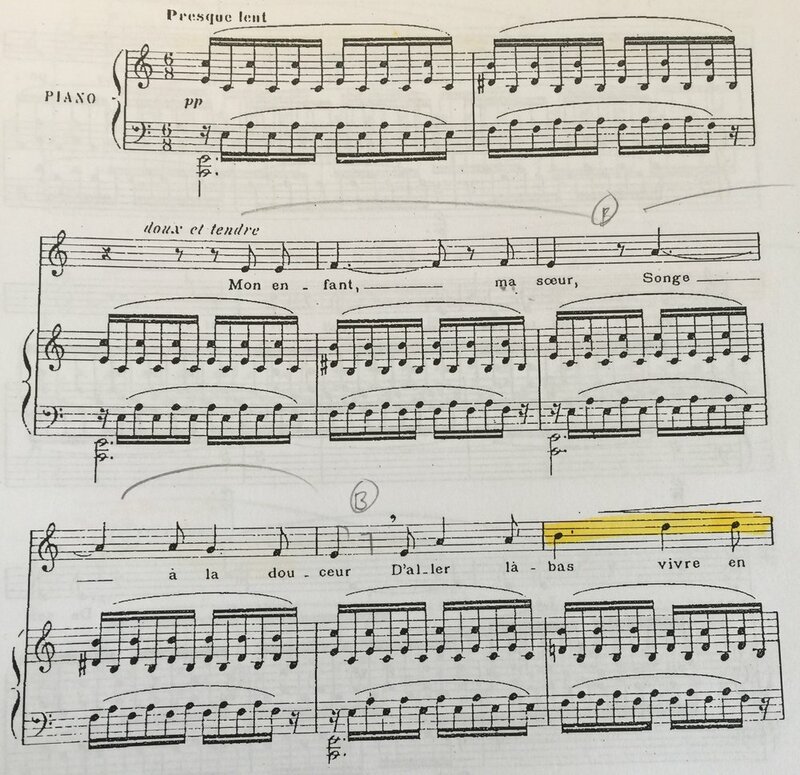 For women, any notes at or below the primo passaggio are highlighted green, and any notes at or above the secondo passaggio are highlighted yellow. Once they've highlighted their scores, they have a visual cue to allow the voice to shift registers [I use the time-tested analogy of smoothly shifting gears in a manual transmission car]. I do not have them highlight every score, but some students find this practice so helpful that they transfer it to many, if not all, of their scores. So here's an example from an actual score, Duparc's delicious "L'invitation au voyage." The highlights are for baritone passaggi. When I sing the above passages, mindfully moving into and out of the passaggi where indicated, all is well. If I am late to a register change, poor sound and vocal strain ensue. Here's an example for a soprano, using the green + yellow system described above. Note that I'm using the standard passaggi of primo around E4 and secondo around F#5. 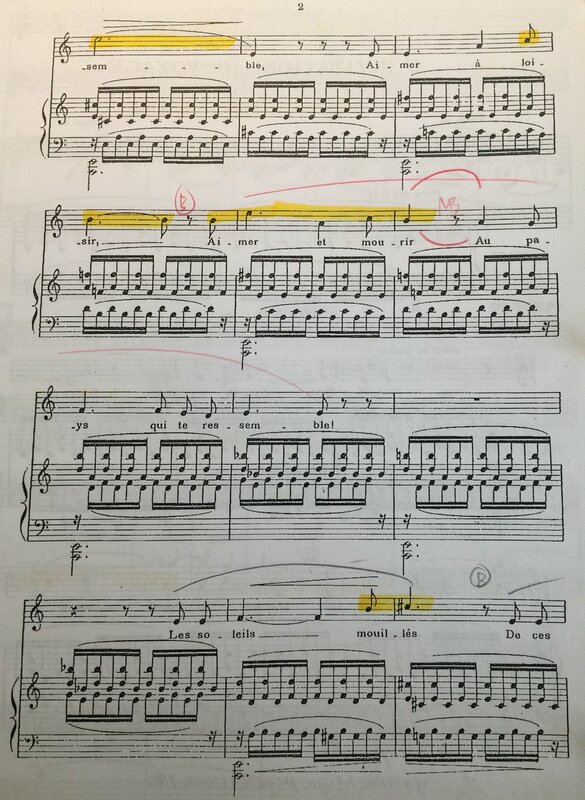 For this reason (among others), I find the Estelle Liebling Vocal Course invaluable, since she writes out the exercises in the actual keys one would sing them in, and therefore the student can be looking at precisely what they're singing in progressive keys. This is Exercise 22 from the soprano volume of the Estelle Liebling Vocal Course. Empirically, I have found the vast, vast majority of singers to have "conforming" voices, meaning in this case that their passaggi are identical to or very close to the accepted norms. Perhaps there's a certain type of student who is drawn to being "different," who desperately wants their voice to operate in a unique fashion. Regardless, upon further investigation, all but a few voices I've taught conform very closely to the widely-shared average passaggi below. My best advice is to face the passaggi head-on. As mentioned earlier, a relatively brief period of close attention to this issue nearly always solves a host of correlating issues, and also creates a habit base that can make this behavior nearly automatic. A mistake I see time and again in beginning and intermediate singers is "the wandering larynx." Laryngeal stability, like vibrato, is a tricky subject, because too much attention brought to the subject can be just as problematic as too little. BUT, it is a simple fix that can reap incredible benefits on the sound, and ignoring problematic laryngeal positioning is disasterous. Let's tackle the extremes first... Position 1 -- the larynx is pressed down too low. The sound is woofy, way too dark, phonation is uncomfortable, the tongue root is tight, etc. Position 4 -- the larynx is way too high, and the resultant sound is "necktie tenor," childish, nasally, bright. So neither Position 1 or Position 4 are ever desirable, except *perhaps* for comic effect. Position 2, sometimes called the "comfortably low larynx," is one of the pillars of good classical sound. Position 3, a moderate position of the larynx, is a totally healthy location for the larynx, and renders a sound that is more appropriate for pop singing, folk singing, musical theater--basically all non-classical genres. So, when you hear musical theater being sung "too operatically," it's highly likely that one of the primary issues is that the larynx is too low--it's in Position 2 rather than Position 3. The reverse is true--when you hear "popera," and the sound is too poppy for the genre, the larynx is likely in Position 3 rather than Position 2. Within either genre, singers need to be aware of certain situations in which the larynx tends to rise. As pitch ascends, it is very common to see a singer's larynx rise. Especially when pitches leap up suddenly, it is all too easy and tempting for the larynx to pop up to try to "reach" the pitch, as if it is "up there" somewhere. A good fix for this is to go back to the beginning of the phrase and breathe in the position of the highest note--thus, you're ready far in advance for the leap. Another way to practice is with pitch glides. Start with small pitch glides, something like 1-5-1, keeping the larynx in a comfortably low position. Then gradually expand the glides, keeping the larynx comfortably low. Also, it is critical to let the larynx rock and tilt within all of these positions--the larynx needs to be free to make subtle adjustments within the positions described above. Caveat 1: There is also a vogue of artificially darkening the sound, especially among low-voiced male singers. In other words, baritones wanting to sound more "manly" by singing in Position 1 when they should be in Position 2. This is to be avoided, as it makes a fake sound and can "shave years off of careers!" I have observed that younger singers too often sing with a higher larynx than they should, and older singers too often sing with a lower singer than they should. Caveat 2: Any experimentation with laryngeal positioning should be done with supervision of a competent teacher.